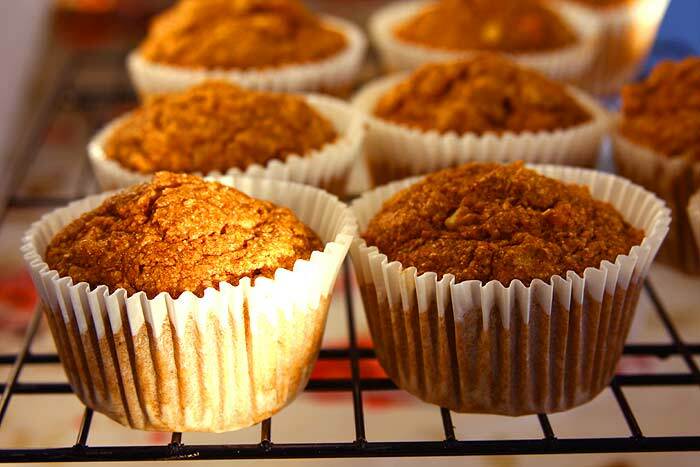 Can you believe that I made these moist and healthy apple bran muffins using store-bought muffin mix? I usually prefer baking from scratch but sometimes due to lack of time and convenience, I depend on store-bought cake mixes from time to time. Let’s face it, the usual name brand cake mixes are far from healthy which I have accepted to live with because I do not use it very often. The other day while I was grocery shopping I was wandering in the baking aisle for no reason as always and laid my eyes upon this apple bran muffin mix. I have never baked using store-bought muffin mix up until then. I immediately scanned the ingredients and what? Did I see it right? 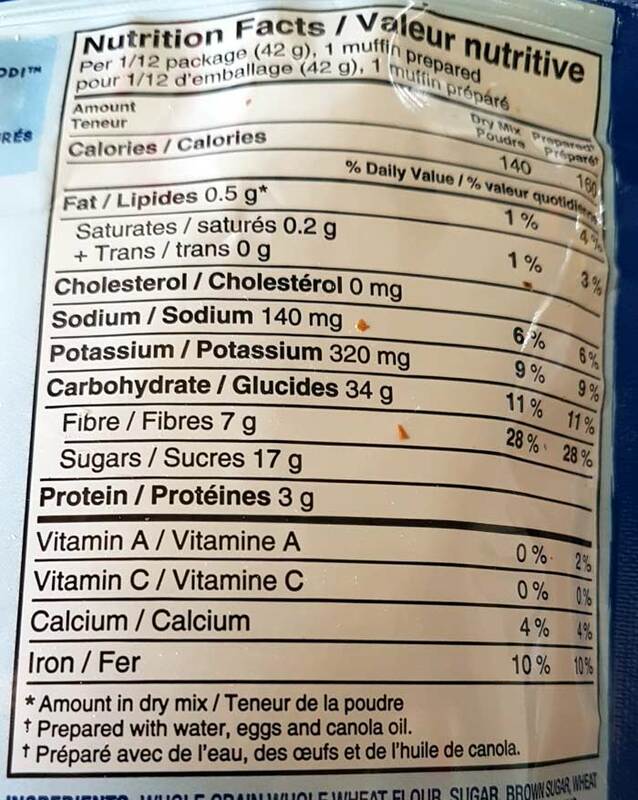 How can a store-bought mix be this healthy without any added preservatives or artificial ingredients? Whole grain whole wheat flour, sugar, brown sugar, wheat bran, dried apples, oat hull fiber, rolled oats, apple powder, baking powder, spices (contain cinnamon), salt. It’s made with 100% whole grain whole wheat flour, of course, has sugar and no sugar alcohols, wheat bran, oats and oat fiber, apple powder, baking powder, cinnamon, and salt. That’s it. Clean and simple. No long list of names that you can’t even spell or pronounce. How can I not buy it? Also while checking the instructions to bake the muffins I saw that all it needed was a tablespoon of oil. Low-fat too! Two thumbs up again! So I took 2 packets of the same without hesitating. 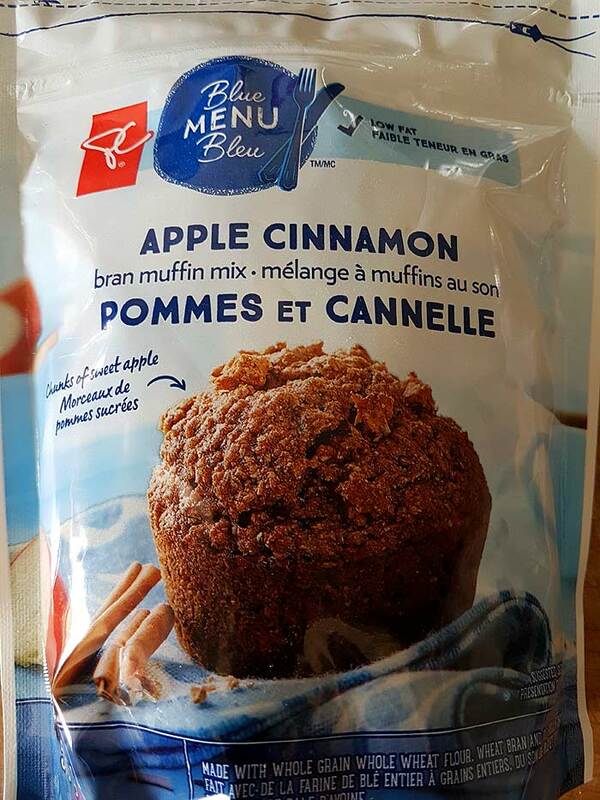 Checked few other muffin mixes from the same brand but the others were not as clean and healthy as this apple bran muffin mix. 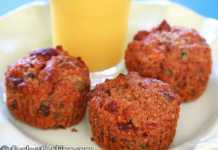 Usually, for bran muffins, flax egg is a good egg substitute. The instructions called for 2 eggs which I have replaced with one flax egg and apple cider vinegar to give the muffins an airy texture. 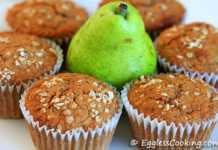 I also used the trick which I had implemented in this vegan banana pecan muffin recipe to mimic bakery style muffins, to give it a good rise and nice golden color and it worked like a charm again. My intuition served me right again and these vegan healthy apple bran muffins turned out great and didn’t taste “healthy” at all. The kids loved it! Baking healthy doesn’t have to be hard, scouring for healthy ingredients in a health food store spending a fortune. 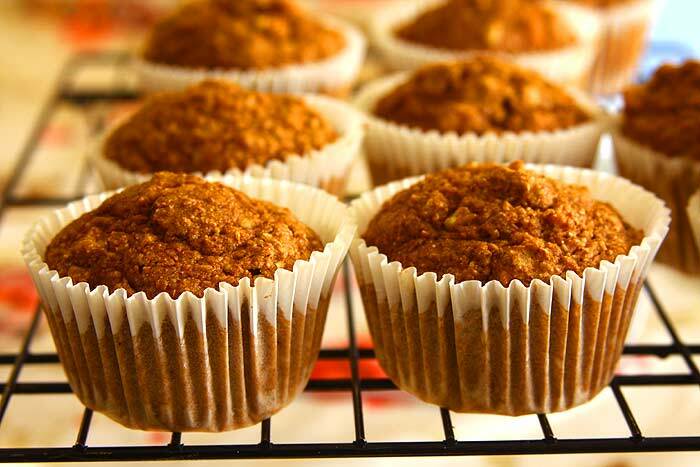 Get this whole grain apple bran mix and you can bake healthy, low-fat apple bran muffins in no time. Preheat oven to 400F for 15 minutes. Line with cupcake liners/grease a 12-cup muffin tin. Empty the contents of the muffin mix in a large bowl and make a well. In a medium-size bowl, stir together the remaining liquid ingredients and let it aside for 5 minutes. Stir in the wet mix into the dry mix. Do not stir too much. Scoop out about 1/3rd of a cup of the muffin batter and fill the lined muffin tins evenly. Bake at 400F for 10 minutes and then reduce the temperature to 375F and bake for another 8 minutes or until a toothpick inserted in the middle comes out clean. Remove the tin from the oven and place it on a wire cooling rack for about 5 minutes before taking the muffins out. Cool the muffins completely on the wire rack before storing it a container. 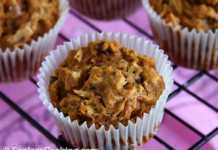 If you don’t want to make vegan apple bran muffins, use dairy milk instead. We are not using any leavening agents in the recipe because the mix already has baking powder in it.